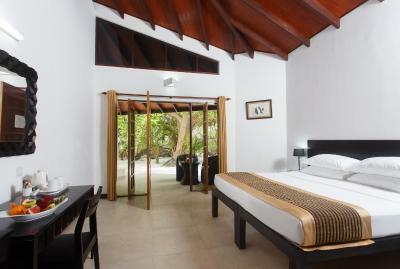 Lock in a great price for Embudu Village Resort – rated 8.7 by recent guests! It was perfect. Best snorkeling ever! We will come back. We choose half board which was perfect for us. Free wifi in the island and worked very well. The room was exactly as I expected from the pictures. The location was amazing with beautiful waters, plenty of places to leisurely swim around the island as well as numerous locations for snorkeling (was able to see gorgeous fish). It is a very quick boat transfer to the airport. 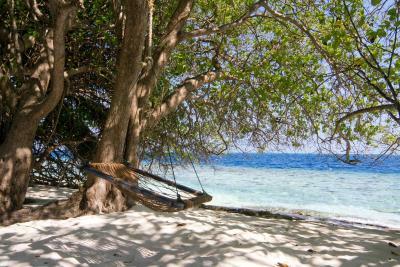 A beautiful atoll that is a short boat ride from the airport. The resort has been in business for a long time, and they really know how to run the operation correctly. Excellent value. The services were excellent, very good place for relaxing vacation. 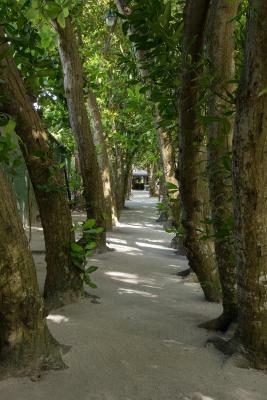 The island is well maintained hy staff. It was last minute booking, so my expectation was not high but the hotel surprised me! Staff were very nice, location good, food with many options! Each room has its own table in the restaurant so you don’t need to hurry, and on the last dinner they prepared a special farewell decorated table. Also the last two nights we have got free upgrade to the bungalow !!! All staff were extremly helpful and friendly, always smiling and ready to assist you. The island is very clean, the nature, fauna and sightseeing are perfect! Very good food and variety. The omlette was amazing, very fast cooked in front of us by the Chef, extremly delicious. Airport transfer with the speedboat was very well organized. Many thanks to all Embudu Village staff for helping us to have a great vacation! Best regards! The room was in front of beautiful beach and view. Very good location for us to swim. Perfect breakfast. Especially the staff of the otel were nicely. Had a fantastic time at Embudu, the staff couldn't have been nicer or more helpful. 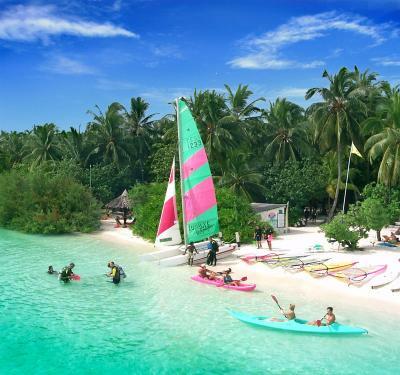 Lovely island and great for spotting sharks, sting rays and more! Transfers to and from the airport all very well run and convenient. Embudu Village Resort This rating is a reflection of how the property compares to the industry standard when it comes to price, facilities and services available. It's based on a self-evaluation by the property. Use this rating to help choose your stay! Located in South Male’ Atoll, it takes 20 minutes’ speedboat ride from Velana International Airport to reach the island. This simple yet naturally beautiful private island is 1.9 mi long and takes about 5 minutes to walk from one end to the other. Blessed with a beautiful white sandy beach, the island itself is an beautiful natural hideaway, with lush tropical vegetation and opal white beaches. 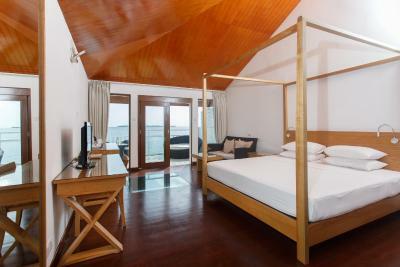 The hotel features beautiful cozy rooms including Beach Bungalows and Water Villas. Embudu is famous for its stunning house reef and spectacular world class dove sites which 35 of them are in close proximity. Rays, sharks, turtles, morays and many other amazing creatures can be found in the house reef alone. With some of the most experienced dove instructors in the industry; Diverland – Embudu offers extensive range of scuba diving courses from Discover Scuba dove to Dove master courses. Whether a professional diver or an amateur, guests are in good hands when diving with Diverland. A variety of exciting excursions can also be provided. The Serena Spa – an international wellness group at Embudu offers wide range of massages and rejuvenating packages for those looking for a more relaxing holiday. 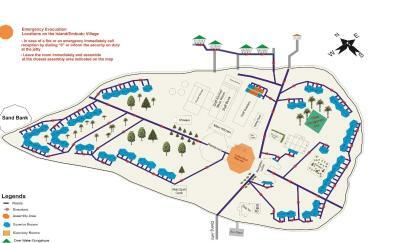 When would you like to stay at Embudu Village Resort? 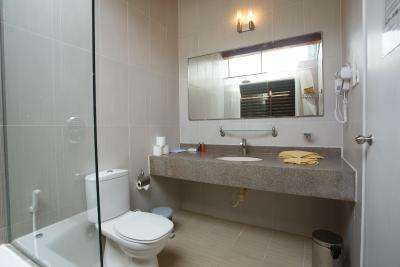 This bungalow features air conditioning, tile/marble floor and electric kettle. 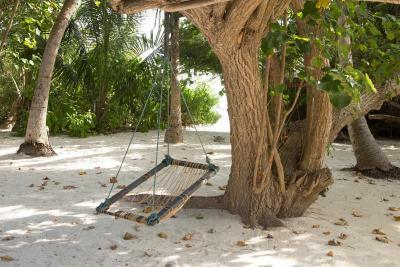 House Rules Embudu Village Resort takes special requests – add in the next step! One child under 12 years is charged USD 85 per night when using existing beds. Embudu Village Resort accepts these cards and reserves the right to temporarily hold an amount prior to arrival. Children sharing in same room between 3 – 12 years will be charged at USD 80 per night. Mandatory green tax of USD 6 per child/infant per night will be charged. Fruit basket, small bottle of wine and bed decoration once during the stay. The chef cooks the meat too long, especially meats and fish so it is very dry-same with the pasta. One of the dinner guys was a bit too friendly for me, but that could be me and my need for personal space. He was talking to me and put his hand on my shoulder. Otherwise, the food was good and they had lots of deserts. Also, the full board does not mean it includes drinks or soda. You have to pay for your soda for dinner. If you are scared of sharks and manta rays, don't get in the water. They will come right up to you. They don't do anything from what I saw with other people, but I got out of the water when they came close. I found that if I went around noon and came out of the water by 4/5, they weren't around as much. I love watching them but I don't want to be too close. 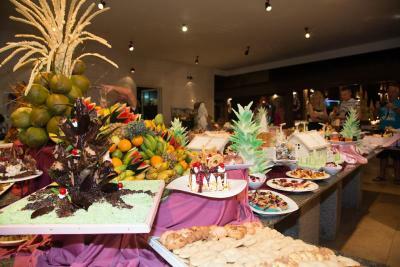 There were different kinds of food to choose from the buffet and they changed the theme every day. I had an issue with the wrong room being booked because the booking.com app stated the room I checked into had a tub-I wanted it for my back to soak, however when I got there, there was no tub in the beach bungalow, only the water bungalows. They switched me there. The water bungalows are really nice. They're a little old and need to be updated, but it was still really cute and I could sit out on the balcony and watch the fish and the sharks. It was good. I got to relax. The place is very clean and peaceful. There are lots of spots to snorkel. The guy in the gift shop is really nice and will help you with anything you need. I needed goggles with a prescription and he had the prescription glass but I couldn't' find goggles for them to fit in. He found a pair and put them in for me. I was excited cause I could not see what was coming for me in the water!~! Mainly fish...parrot fish are pretty...barracudas are scary but they mind their business...sharks just wanna see what you look like...I don't want to see them though. jajajaja. But it was nice to watch them and follow them around. The eagle rays will swim around and put on a show. This guy tried to follow them in the water and they "flew everywhere" (I thought he was crazy). What I really liked was the swings in the trees near the water. You could swing in them and read a book. They do however need a cushion placed there for your head cause the wood is very uncomfortable..I just stuck a towel there so that did the trick. Also what is really cool is it is 45 min from the airport with a reasonable transfer fee both ways. It was a short trip, so being close to the airport was important. 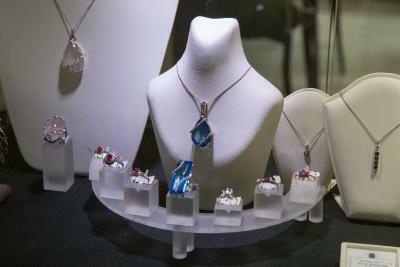 There's also a really cool jewelry shop there too. The bed was a bit hard, but I still slept well. Amazing fresh and tasty food. Very well kept place, not crowded. Very friendly and nice staff. 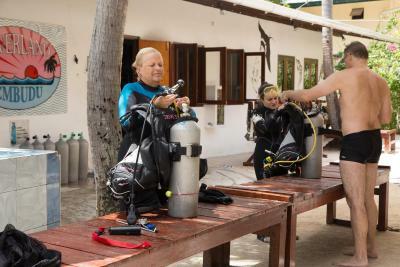 Own dive school on the island and easy snorkeling possibilities. Great place for the money. Very relaxing. Very friendly staff. Perfect beaches and places for dive. The area is very very beautiful and it takes only 15 min to reach the island from the airport which is great! A tv in the room maybe? But also nice to switch off a bit. The staff were lovely, it was quiet, beautiful, relaxing & felt safe. Nothing, the staff is very nice and very accommodating. The island is beautiful. Our plan landed late but the staff organized the transfer within 15mn. we did not lose time and enjoyed our first day as planned. We recommend Embudu without hesitation. Beds to hard and uncomfortable. Food good and varied. Snorkling superb,bar and sun deck nice. Very clean resort. Transport from Male airport was arranged by the resort. Beach bungalow was awesome. 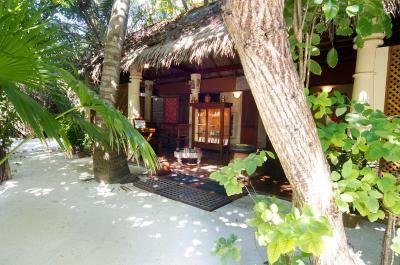 The bungalow was facing the beach and staff was really helpful. Food was really good and lot of dishes was available.The restaurant manager was really polite and helpful. Place is really quite and peaceful. Very thin walls with neighbours, room cleaning times were super random. the staff was very courteous. The restaurant manager is quite nice and takes care of your needs very nicely. Thasleem in the restaurant is quite good. The beaches are so pristine. Rooms are spacious and very well kept. The "small bottle of wine" as a welcome drink should be called "tiny bottle of wine". If you are full board, the beverages, as you can expect, are very expensive. Mediocre tea and coffee at the restaurant. Beautiful, quite, cosy island. 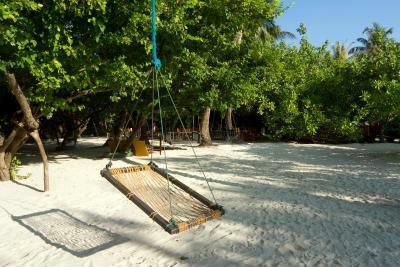 Although there are quite a few bungalows, you never get to seem more than a handful of people on the beach. The beach bungalows are great, especially from the southern side of the island- you get a view over the open sea. The reef is fantastic (albeit bleached), the food delicious, the staff helpful. A solid 10/10. 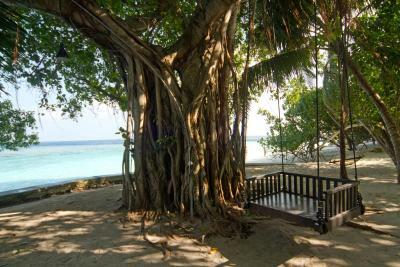 Embudu Village Resort on the Maldives was a perfect high light after our 4 weeks trip through Sri Lanka. Although the reefs surrounding the island are death, apart from tiny signs of recovering, the amount of colourful fishes was impressive for us. 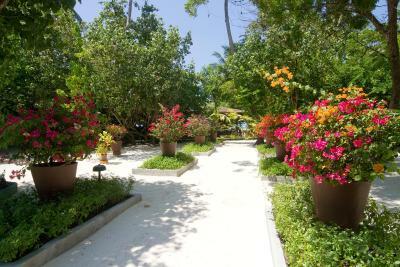 In our opinion this island is not excessive luxurious, but rather normal, however with a perfect management. Room service, cleaning the sand everywhere, service in the dining room we found engaged and helpful. Our room was huge, well equipped as was the bath room. 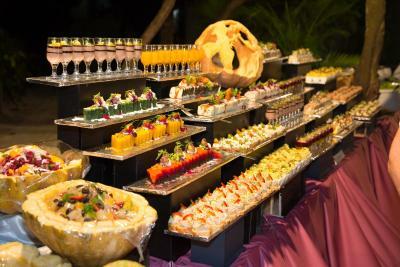 The buffet was more than opulent and additionally fresh meals of fish, chicken and vegetables were prepared outside of the dining hall. Drinks in the bar and restaurant were to pay (also water) for full board, not all inclusive, but we got 2 bottles of water every day in the room. We did not pay for the Wifi, which was working fine in the room. Transport from and to the airport functioned well. We are totally satisfied with everything and could imagine coming back one time. It might be good to add a few more signals in the pathways to direct guests to the various areas eg. Bungalows, restaurant, diving center, etc. Overall service and customer attention. Location is fantastist particularly for snorkelers there are plenty of fish just a step away from the bungalow! The natural feeling of the very small island.